We would like to present to you Anrealage’s Fall/Winter 2018 Women’s Paris collection.Photography by Matthew Reeves. We would like to present to you Dries Van Noten’s Fall/Winter 2018 Women’s Paris collection.Photography by Eugene Rabkin. We would like to present to you Yang Li’s Fall/Winter 2018 Women’s Paris collection.Photography by Matthew Reeves. We would like to present to you Ann Demeulemeester’s Fall/Winter 2018 Women’s Paris collection.Photography by Matthew Reeves. We would like to present to you Uma Wang’s Fall/Winter 2018 Women’s Paris collection.Photography by Matthew Reeves. We would like to present to you Rick Owens’ Fall/Winter 2018 Women’s Paris collection.Photography by Matthew Reeves. This women’s season, tampered by debilitating cold, held few surprises. Designers by and large stuck to what they do, but they did it so well that those of us who prefer to dig deep were largely satisfied. 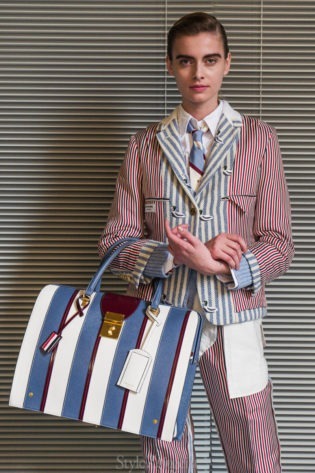 Those who prefer fashion to be some kind of an amusement park with clothes, not so much. I’m in the former camp for the most part, though I, too, get bored. 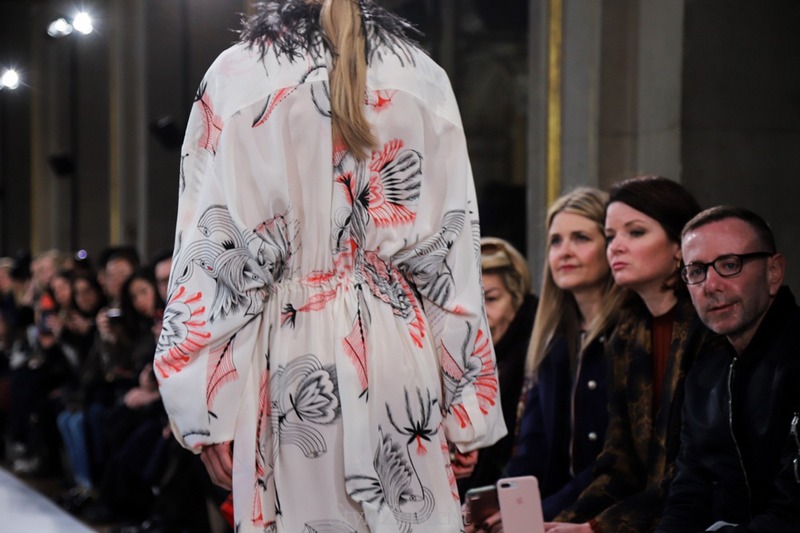 I also wanted to note that this season many designers really took advantage of what Paris has to offer in terms of location – from the stunning Hotel de Ville for Dries Van Noten to the Gothic church of Saint-Merri for Yang Li, to the ornate library at the Lycée Henry for Uma Wang. 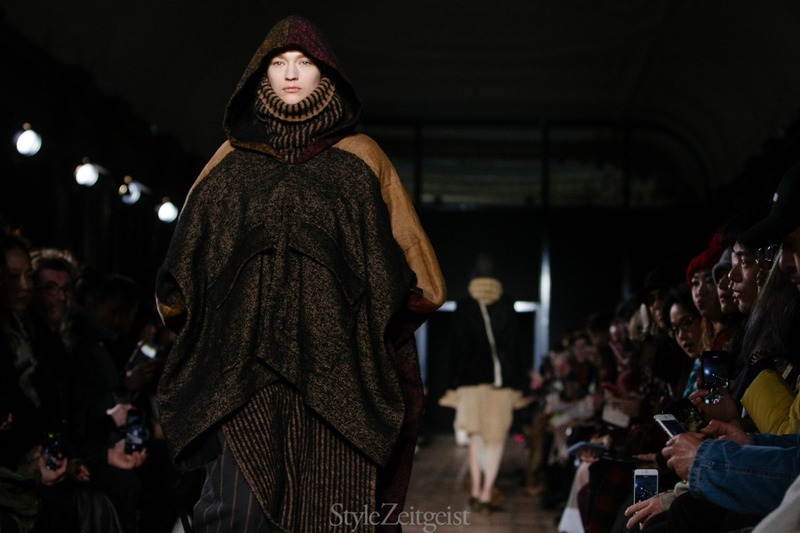 For me the Paris Fashion Week began with the show of a relative Japanese newcomer, Anrealage. 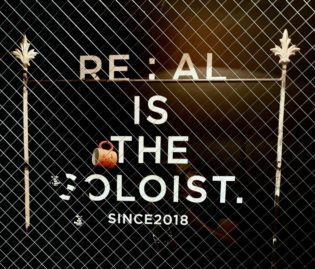 I have followed the brand for several years, and I still cannot make up my mind about it, which I like. 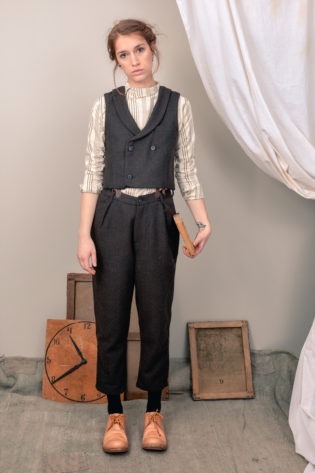 Kunihiko Morinaga constantly experiments with physics through clothes – mostly in his fabric choices. 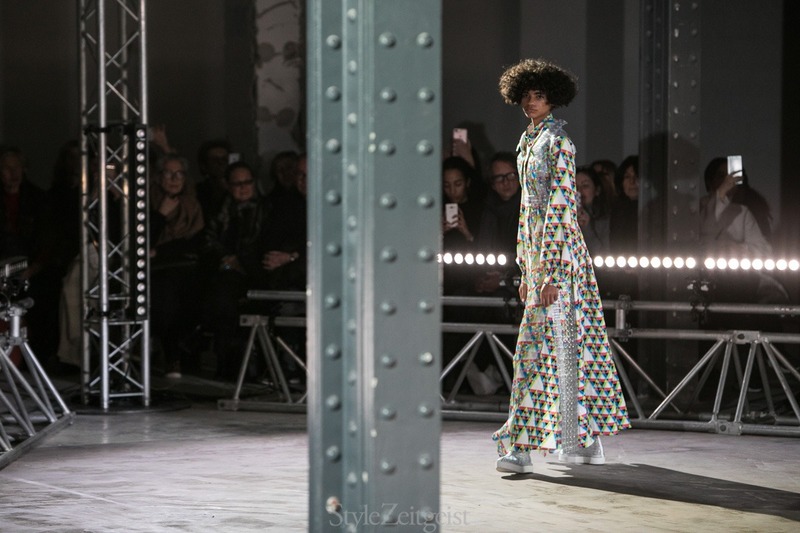 His shows remind me a bit of the amazing experiments Hussein Chalayan conducted in the last decade, though they lack Chalayan’s philosophical framework. But there is some kind of philosophy in the clothes, and in the world of mindless consumption (Balenciaga) and empty sloganeering (Dior) that fashion has descended into, it feels good that someone still thinks in concepts. To wit, Morinaga explored the relationship between the body, the clothes, and physical power. He magnified garments threefold, and then shrunk them back with elastic. He used elastic tape, borrowed from kinesiology, to hold the garments together and to make argyle patterns. And finally, he used mechanochromic material that emits a more increasing amount of light the faster you move. How did it all look? Pretty satisfying. Besides all these experiments that few final customers will be privy to, there were some neat silhouettes and fabric combinations – and I particularly liked the three-layer skirts and the long coats, both in color and in monochrome. The next day my first show was that of Dries Van Noten, and here was a bit of an oxymoron of a surprise. One thought that popped into my head was that while Van Noten manages to simultaneously have a pretty wide aesthetic direction – as opposed to say Ann Demeulemeester or Yohji Yamamoto – you still kind of know what you are going to get. And what we got was ornamental beauty of the first order – prints and brocades, sometimes broken up by metallic inserts. The show was inspired by Art Brut – or outsider art – though you would not be able to discern that if you did not have the press notes – at least I couldn’t. The thing with Van Noten is that even when he tackles edgy subjects – like Francis Bacon – he still softens them in his own way. Though I cannot help but wonder what it would look like if the master horse whisperer of the fashion world would give out a scream once in a while. 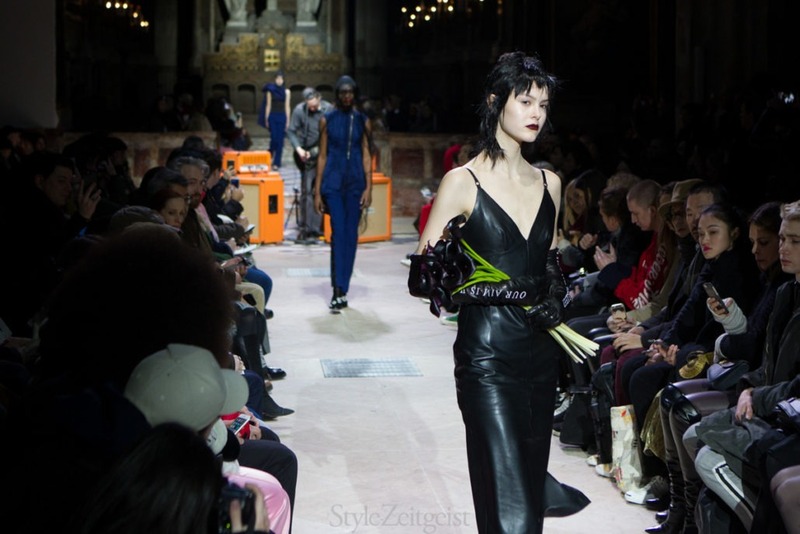 From Van Noten’s softness I was jolted into the hard-edged world of Yang Li, who staged his own goth funeral of a show to a live performance of Justin Broadrick of the industrial band Godflesh. The veiled models walked stately; Li’s funeral flower of choice were calla lilies from the cover of the Swans album The Burning World. Obviously, black was in abundance, but there was also stunning shades of purple and blue, particularly impressive on a cape. There was Li’s signature luxe tailoring scythed with a raw edge, and inverted back seams with an oversized seam allowance that is becoming Li’s signature. Lest you think it was all doom and gloom, Li imagined himself living to a 100, which, depending on how you view life, might be a positive. 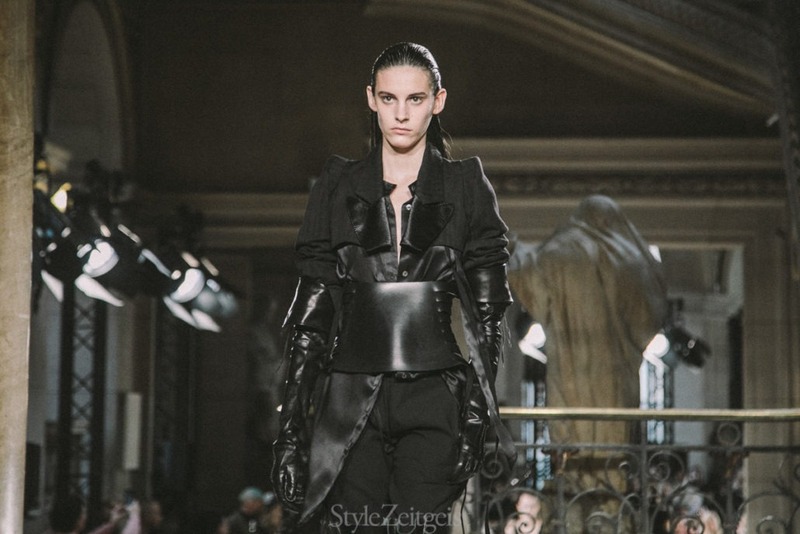 My first show of the next day was Ann Demeulemeester, where Sebastian Meunier finally tipped the poet-warrior balance of the Demeulemeester look firmly into the warrior territory. It was a welcome and exciting change from the overload of flounce in his previous collections. The clothes hewed close to Demeulemeester’s archive, sometimes direct copies and sometimes modifications of her dramatic, raw-edged shearling shrouds, gauntlets, and super-wide belts. The fortified shoulders that Meunier applied to his tailoring added drama on top of drama, and Bella Lugosi Is Dead, the original goth anthem by Bauhaus, could not have been more fitting of an accompaniment. Later that day at Uma Wang, the designer did what she does best – her talent is in the lush fabrics, which she assembles in deft combinations and applies to vaguely Victorian silhouettes. 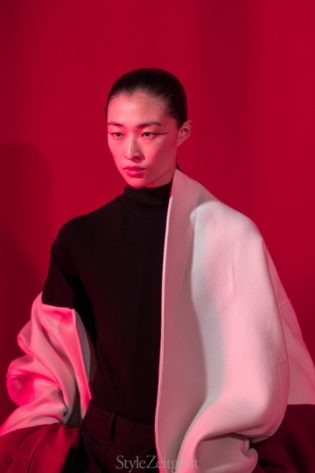 I like the Uma Wang woman – there is a sense of mystery there, and I imagine that if the Yohji woman decided to wear color, she’d go straight to Wang. It was all fine, but I couldn’t help but wish for a bit more of a development. A designer of Wang’s caliber would do well to widen her vocabulary. Speaking of narrow vocabularies, the Rick Owens show felt like someone playing a piano with eighty-four keys removed. It was set to a cheesy piano bar song that practically called for a slow-paced show, but the models walked so fast and so close together that it was all over in a flash. I had to go back to look at the photos to see that there were indeed forty looks shown, though it felt like twenty-five. Rather, actually it felt like four or five looks repeated in different colors and fabric variations. On the positive side, the coats were weirdly elegant in that “it looks crude but isn’t” way that Owens is so good at. Oh, well, no one can hit it out of the park each season, and that’s always been Ok by me.